The Apt. Sagrada Familia apartments Barcelona are comfortable and private tourist apartments in Barcelona. They provide top shared-apartment facilities close to the top tourist sites in Barcelona. They are perfect for travelers who need a rest from huge dorm rooms and overcrowded common areas but still want the benefits of a youth hostel environment. It is just like having your own shared flat in Barcelona with a special Sant Jordi bonus. Our huge downstairs common area is open 24 hours, has a fun friendly atmosphere and can be used by all Sant Jordi Sagrada Familia guests. The apartments can also be rented in their entirety and are perfect for large groups or family accommodation. Our Sant Jordi Apt. Sagrada Familia Apartments in Barcelona are a dream-come-true for travelers looking for a little independence and privacy. Each apartment has one private room, one or two double rooms and one or two four-bed dorm rooms. The apartments are shared among 7 to 10 guests or can be rented in their entirety for group or family accommodation. Each apartment includes one or two bathrooms, a living room with sofa, TV, dining table and balcony, and a fully equipped kitchen, with fridge, electric oven, stove-top, and all the necessary cooking utensils. Downstairs, at the reception we have a huge, skateboard inspired, modern common area. If you need a little fresh air, we also have a large outdoor private patio area, open during the day and accessible by all guests. Besides all of this, we also provide laundry facilities, towels, 24 hour free internet access, free lockers (for the shared dorms), free storage room and a cleaning staff that works every day, ensuring the facilities are spotless. The Apartments Sagrada Familia hostel, by Sant Jordi Hostels Barcelona, is well located in a popular local area, just 10 minutes walk from the best site in Barcelona, Antoni Gaudi’s famous Sagrada Familia Cathedral. We are also well connected to all the main tourist attractions of Barcelona. With 2 metro lines, the L2 (Purple) and L5 (Blue), less than 5 minutes walk from the hostel, you can be anywhere in Barcelona in under 15 minutes. We also have 3 night-bus lines that stop within 3 blocks of the hostel so you don’t have to worry about how to get home at night, no matter what the hour. A key-card deposit of €10 per person must be payed at the time of check-in. This deposit is required to ensure the successful return of the key-cards that provide access to rooms, common areas, and lockers. The deposit will be refunded at the time of check-out under the condition that the key-card is successfully return to the appropriate reception staff. In the event that a key-card is lost or stolen, or is for any reason not returned in an appropriate manner at the moment of check-out, the €10 deposti will not be refunded. We provide a traditional youth hostel environment that is perfect for large groups or solitary travelers. 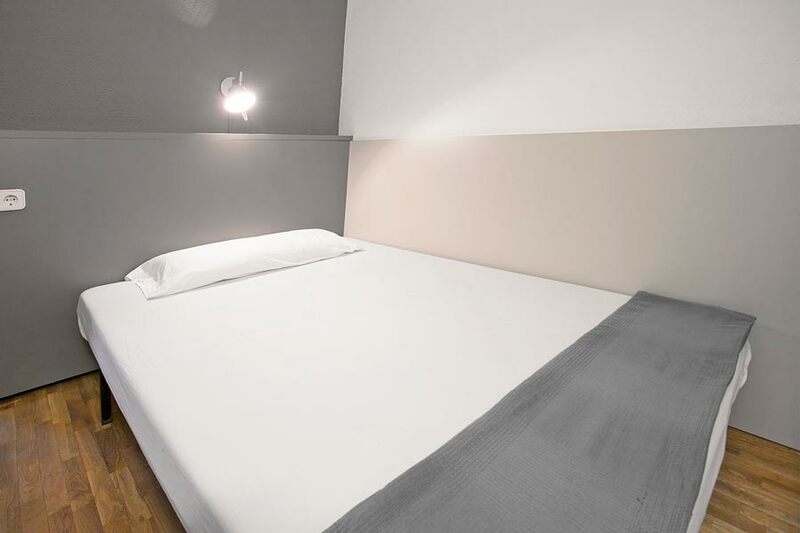 However, being a party, youth hostel & due to some previous misunderstandings we would like to provide a few recommendations: For a mellower, but still traditional youth hostel atmosphere we recommend the Gracia hostel by Sant Jordi Hostels. For families, children under the age of 16 or adults over the age of 50 or for people who prefer a little more privacy and independence but still want the choice to enjoy a sociable environment and participate in fun night activities, we recommend our Sant Jordi Apt. Sagrada Famlia. We will of course receive you happily here. We just want to state clearly that it might not be suitable for your particular needs. Apt. Sagrada Familia by Sant Jordi Hostels Barcelona provides comfortable apartment style accommodation in a Barcelona hostel environment. The apartments are fully equipped and designed to meet the unique needs of hostel guests. The Apartments Sagrada Familia, by Sant Jordi Hostels Barcelona, is well located in a popular local area, just 10 minutes walk from the best site in Barcelona, Antoni Gaudi’s famous Sagrada Familia Cathedral. We are also well connected to all the main tourist attractions of Barcelona. With 2 metro lines, the L2 (Purple) and L5 (Blue), less than 5 minutes walk from the hostel, you can be anywhere in Barcelona in under 15 minutes. We also have 3 night-bus lines that stop within 3 blocks of the hostel so you don’t have to worry about how to get home at night, no matter what the hour. 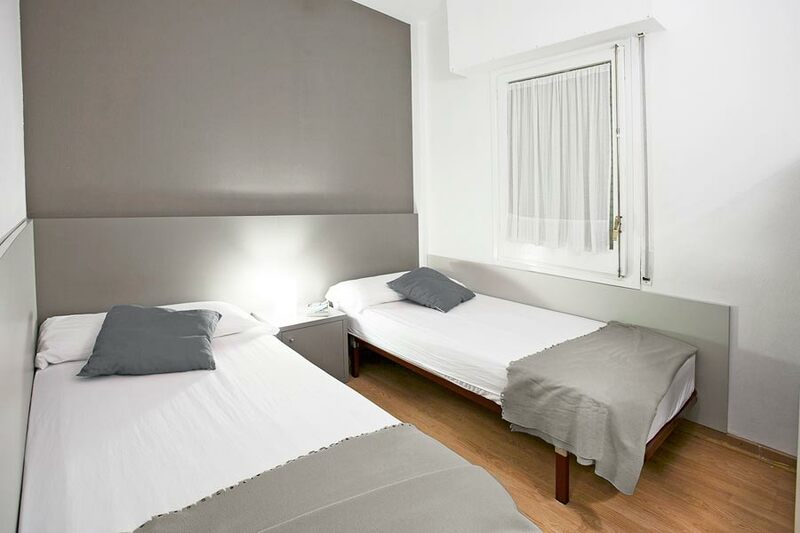 At the Sagrada Familia hostel in Barcelona, customers have the choice of staying in private double or shared dorm rooms. We also offer ensuite rooms with private bathroom and shower facilities. Located upstairs from the sagrada familia hostel area. 1 twin bed in the apartments section of the Sagrada Familia hostel, with night-stand, security locker and a shelf unit for hanging clothes. 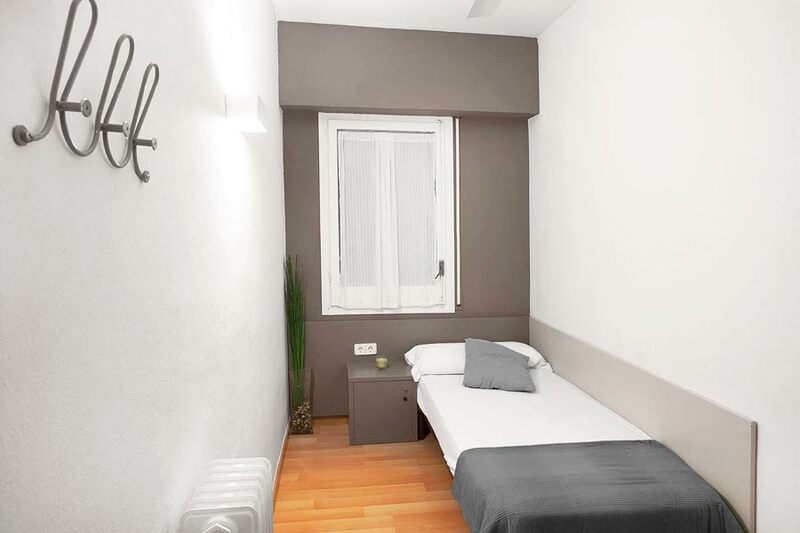 1 double bed for up to 2 guests in the apartments section of the Sagrada Familia hostel, with night-stand, security locker, and a shelf unit for hanging clothes. 2 twin beds in the apartments section of the Sagrada Familia hostel, with night-stand, security locker, and a shelf unit for hanging clothes. 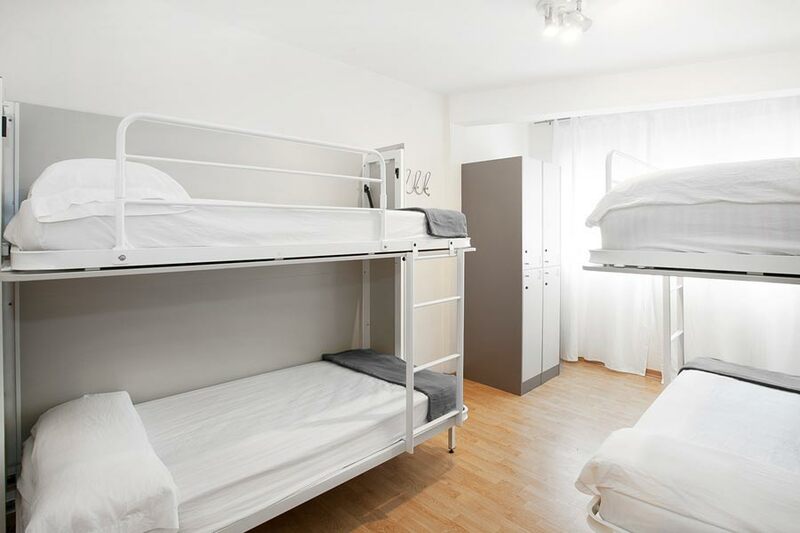 4 bunk beds in the apartments section of the Sagrada Familia hostel, with security lockers, individual head-board cubbies, reading lamp and charging station.